Inhabitat proudly attended the 8th Annual Gorgeous and Green eco fashion show fundraiser for Global Green USA earlier this month and took in an array of mind-blowing fancy fashions made from sustainable sources. Gorgeous and Green event co-chairs, Zem Joaquin and Nadine Weil outdid themselves with this year’s ‘White Winter Cocktail’ theme at the historic LEED-certified Bently Reserve in San Francisco. Even the organic Korbel Champagne and eco-friendly 360 Vodka drinks were made to match. Read on for a look at this year's fashion show! 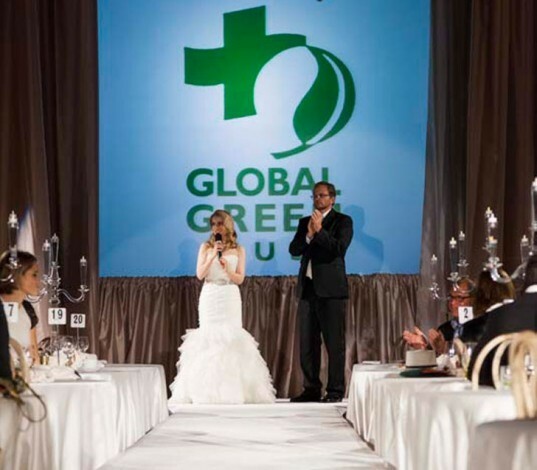 Global Green USA raised $230,000 at the event, which will fund back-up solar systems on critical buildings and schools impacted by Hurricane Sandy, seed funding for green rebuilding entrepreneurs, and sustainable neighborhood infrastructure in New York and New Jersey. Once again, we were at a loss for choosing our favorite designers, as there were so many luxurious get ups to choose from. We fell in love with the Parisian style of Amour Vert, while the made-in-the-USA eco-conscious fabrics beamed national pride. The Ikat orange recycled polyester tunic dress was especially wearable and festive. Naturally, PACT underwear kept us on our toes, as we blushed at the many tight ab’d underwear models walking down the runway. Made from organic cotton with fair labor practices in energy-efficient factories, PACT promotes change makers with a cause in the fashion industry. San Francisco residents Olga Dzilikhova and Mina Yazdi of Mina & Olya design retro chic sophisticated pieces from California-made organic fabrics. One of our favorites was the buttery Champagne hemp silk charmeuse deep v-neck dress with inverted pleats. We also loved the organic raw silk ragan ivory blouse, paired with an organic boiled wool tulip skirt. Probably the most provocative gowns were made by Tennessee-based design house, Prophetik. We loved the hemp silk gowns with exposed hardware in the back and artichoke layered skirts, hand-dyed with Japanese Indigo from the designer’s garden. We also loved the white winter cocktail dresses of San Francisco-based designer Cari Borja; and in particular, the hooded winter frock dress with full tea length skirt. Cari Borja’s glittery off-shoulder sea foam dress was also a favorite. Oliver Tolentino made custom gowns specifically for the show, using pineapple fiber cloth and ancient weaving techniques from his native Philippines. We especially loved the effervescent shear layers of his full-length ivory gowns. It’s clear to see that the Gorgeous & Green eco-fashion show is an annual favorite of fashionista philanthropists and eco-conscious celebrities alike, and we look forward to the next one! Innovative programs for green schools, green affordable housing, and climate change initiatives, in California and nationally, are making a huge impact on many lives. Event co-chair Nadine Weil and Global Green USA President Matt Petersen take center stage. 2012 Gorgeous & Green ecofashion show ~ it's a wrap!